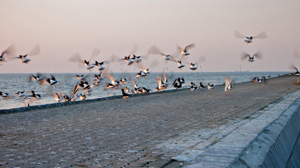 May is always the spring's först promise on the North Sea and on top of that: the island of Neuwerk, 11 clicks out of the Görman coast. On that island I grew up – more or less. 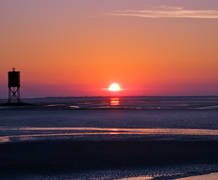 For Katrin it is a hike at low tide through the Wadden Sea what she did with a close friend of mine! Or like me: in a kayak from the 15 clicks distance tiny shrimp fishermen's harbor of Spieka-Neufeld. Both encounters to the island have one thing in common: frost bites for free! The kayak crossing was challenging with a northern force 6, rip curls, incoming tide, cross currents in the ship line and water 5° C, but that's why we're doing it, raitho? 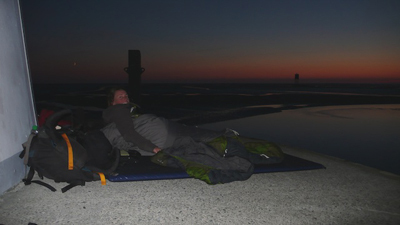 Traditionally we had diner at Lüder's pub ‘Im Anker’ but slept in the friggin' cold on the beach surrounded by bird life by the thousands. Freedom and outdoor life. Some will understand. A next days high tide and ‘high-five-paddling’ in the swell of northern force six and a frosty hike to the 5 mile further north bird island of Scharhörn, bloody and frozen feet inclusive made our day. Görman's only ground breeding Cormorants life there, as no predators has been arrived, yet. The natives eat chicken now! Half frozen and half backed we arrived Lüder's again where the open fire was already spreading the warmth and right atmosphere. Soused herrings in cream and jacket potatoes filled the guts, finish with a double ‘Hanged Man’ (?). You have to go, to find out. That all is Neuwerk in May!